Click the button below to add the Aqua Creek - Accessory Upgrade Kit, Spa Lift Elite - F-SLEUGK to your wish list. Since 2002, Aqua Creek Products is manufacturing high quality aquatic access equipment. The product line Aqua Creek has to offer now includes pool lifts, tub lifts, shower chairs, beach access chairs, in-water exercise and training equipment, underwater walkers, pool access stairs and swim training platforms. Aqua Creek's staff is always dedicated to helping you find the right solution to your pool and spa access needs. We know when we call Aqua Creek, we get an answer right away. The America-based company is well-known for their industry-preferred products, their superior warranties, and their superior customer service. Aqua Creek strives to bring you affordable and reliable products so everyone can get aquatic access. They are constantly changing and evolving their product line to improve its quality and usability to the latest possible product innovations and have become an industry leader for pool lifts in the US. That is why we like Aqua Creek Products! Wouldn't you? AQUA CREEK PRODUCTS, LLC LIMITED FIVE (5) YEAR WARRANTY: Aqua Creek Products, LLC (a.k.a. Aqua Creek) also warrants to the original end user purchaser that products manufactured by Aqua Creek, when properly installed in accordance with assembly and installation instructions, and properly used and maintained, shall be free from defects in material and workmanship for a period of five (5) years from the date of original purchase, provided that Aqua Creek receives prompt notice in writing of any defect or failure and satisfactory proof thereof, with the following exception(s): Exceptions:  All electrical components, including the linear actuator shall have the following warranty period: o Year 1-2: 100% Coverage o Year 3: 60% Coverage (Customer is responsible for 40% of replacement cost) o Year 4: 50% Coverage (Customer is responsible for 50% of replacement cost) o Year 5: 40% Coverage (Customer is responsible for 60% of replacement cost)  Hydraulic actuators and mesh slings shall have a warranty period of one (1) year from the date of original purchase.  Powder coat finish scratches, scrapes, corrosion, or dents from customers normal use, negligence, or abuse This warranty specifically excludes reimbursement for labor to remove, repair, or install the product and any return freight charges. These warranties do not cover any damages due to accident, misuse, abuse, negligence or failure to properly maintain any products, or normal wear and tear from day to day operations. In the event that any products are altered, repaired, or improperly installed or improperly used by anyone without the prior written approval by Aqua Creek, all warranties are void. IMPORTANT: AMOUNT OF WEIGHT PLACED ON LIFT SHALL NOT EXCEED THE RATED LIFTING CAPACITY FOR THE LIFT. NEVER OPERATE THE LIFT UNDER LOAD IN A DRY POOL (WITH NO WATER IN THE POOL). It is the responsibility of the lift owner to verify the weight of the patron for warranty claim purposes and to ensure that the lift is not overloaded. Non-payment for product to Aqua Creek may void warranty. To initiate a warranty claim, the owner of an Aqua Creek product must provide the place of purchase, in writing, with a full description of the product, its serial number, the dates of purchase and installation, and the exact nature of the defect. Within thirty (30) days after receipt of a written warranty claim by Aqua Creek, and barring any unforeseen delays, the place of purchase will be notified of Aqua Creeks decision regarding the claim. If requested by Aqua Creek, any defective product must be returned, freight prepaid, to Aqua Creeks designated factory location or duly appointed distributor for inspection and/or repair. Aqua Creek will, at its option, repair or replace the failed or defective item, and deliver the repaired product or replacement to the buyer of the product, freight prepaid to the destination provided for in the original order. Products returned to Aqua Creek for which Aqua Creek provides replacement under this limited warranty shall become the property of Aqua Creek. A new warranty period shall NOT be established for the repaired or replaced products. Such products shall remain under warranty only for the remainder of the original warranty period on the original products purchased. This written limited warranty constitutes the final, complete and exclusive statement of warranty terms. No person or organization is authorized to make any other specific or implied warranties or representations on behalf of Aqua Creek. THE WARRANTIES SET FORTH HEREIN ARE IN LIEU OF ALL OTHER WARRANTIES, EXPRESSED OR IMPLIED, WHICH ARE HEREBY DISCLAIMED AND EXCLUDED, INCLUDING WITHOUT LIMITATION ANY WARRANTY OF MERCHANTABILITY OR FITNESS FOR A PARTICULAR PURPOSE OR USE. THE SOLE AND EXCLUSIVE REMEDIES FOR BREACH OF ANY AND ALL WARRANTIES WITH RESPECT TO THE PRODUCTS SHALL BE LIMITED TO REPAIR OR REPLACEMENT AT AQUA CREEKS DESIGNATED FACTORY LOCATION, OR DULY APPOINTED DISTRIBUTOR, OR IN PLACE AT AQUA CREEKS OPTION. IN NO EVENT SHALL AQUA CREEKS LIABILITY EXCEED THE ENTIRE AMOUNT PAID TO AQUA CREEK BY THE ORIGINAL PURCHASER FOR THE FAILED OR DEFECTIVE PRODUCT. IN NO EVENT SHALL AQUA CREEK PRODUCTS, LLC BE LIABLE FOR ANY INCIDENTAL, CONSEQUENTIAL, SPECIAL, INDIRECT, PUNITIVE OR EXEMPLARY DAMAGES OR LOST PROFITS FROM ANY BREACH OF THIS LIMITED WARRANTY OR OTHERWISE. THIS WARRANTY GIVES YOU SPECIFIC LEGAL RIGHTS AND YOU MAY ALSO HAVE OTHER RIGHTS, WHICH MAY VARY FROM STATE TO STATE. SOME STATES DO NOT ALLOW THE EXCLUSION OR LIMITATION OF INCIDENTAL, SPECIAL OR CONSEQUENTIAL DAMAGES, SO SOME OF THE ABOVE LIMITATIONS OR EXCLUSIONS MAY NOT APPLY TO YOU.. This item is covered by All-Terrain Medical & Mobility's 30-Day Return Policy with a manufacturer required Restocking Fee. As per our Return Policy, this product may be returned within 30 days of receipt for a refund as long as the following conditions are met: The product must be returned at the customer's expense in the original packaging.The product must be in new condition--no cracks, scratches or dirty marks. A Return Authorization must be requested from All-Terrain Medical & Mobility within 30 days of delivery. Once the Return Authorization has been received at All-Terrain Medical, the product must be returned within 14 days to receive a refund. A 20% Restocking Fee is required to return this product. 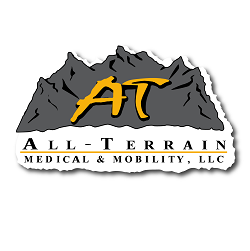 If you have questions about this product please call the All-Terrain Medical & Mobility team at 1-877 255 3871.